Opinions and advisories on a sensible way to finance hospital care in Farmington, a flap over historic portraits in Augusta, and a new sense of relief that is sweeping through the Old Port. Thousands of motorists every day make the mistake of rolling through this lovely old Penobscot River town without noticing it. They should pause and look around. By Richard Grant. By trial and error a much-beloved Brunswick veterinarian discovered the secrets of naturalizing daffodils and transplanting wild lupines. By Jane Lamb. 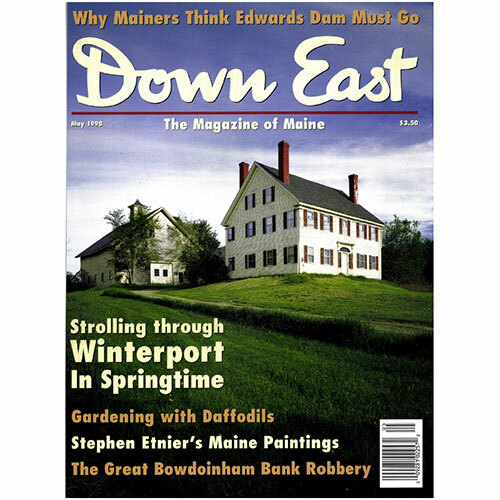 Few have captured the Maine light quite the way artist Stephen Etnier did, nor had as lively a time living here. The first major retrospective of his work is now hanging at the Portland Museum of Art. By Edgar Allen Beem. Throughout his career, Jon Lund has been asking questions no one else has thought of. One of the results is a first-in-the-nation federal order to remove a working hydroelectric dam which just happens to be on the Kennebec River. By Jeff Clark. When the cashier of the Bowdoinham bank was rousted from his sleep, he never imagined it was just the beginning of a crime drama that would grip the entire state. By Wayne Reilly. The odd items George Hinckley collected for his students a century ago still fascinate the kids who visit the L.C. Bates Museum. By Ellen MacDonald Ward. How Do You Save a Baby Seal? You don’t. You call the good folks at Northeast Marine Animal Lifeline, and they will help the little charmer. By Frank Andrews. There were more than just widows and veterans at the dedication of Castine’s Civil War memorial, as a historic photograph suggests. By Ellen MacDonald Ward. Would you believe I can walk around this island wearing a T-shirt with no writing on it? By Caskie Stinnett. Cover: Winterport, by Brian Vanden Brink.